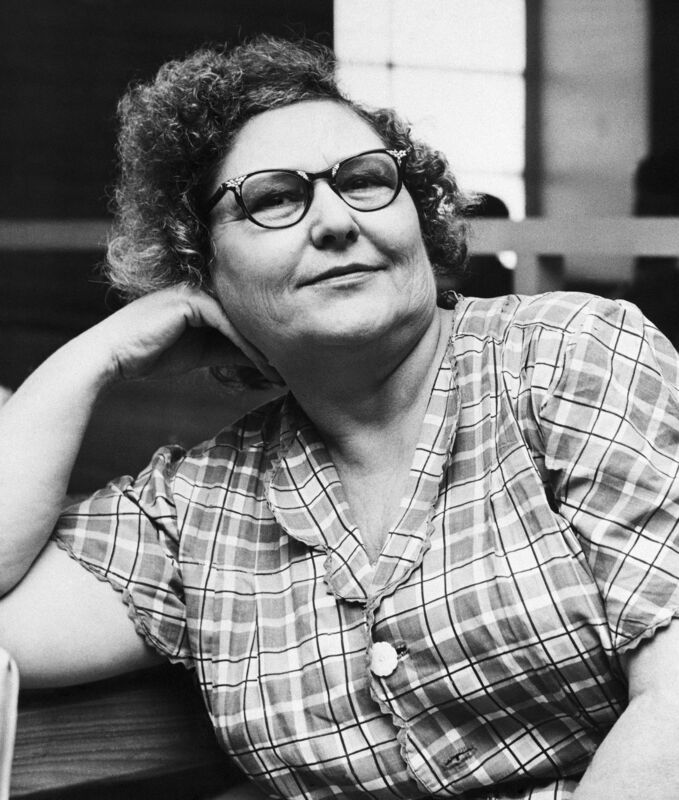 Nannie Doss was an American serial killer that was also known as The Giggling Nanny, The Giggling Granny, The Lonely Hearts Killer, self-made widow, The Jolly Black Widow, and Lady Blue Beard. She was born on November 4, 1905, with birthname Nancy Hazel and died on June 2, 1965. She murdered eleven people from the 1920s to 1954 and confessed in October 1954 after her fifth husband died to the killings. She murdered two of her sisters, four husbands, two children, her mother, one grandson, and one of her mother-in-laws in the states of Alabama, North Carolina, Kansas, and Oklahoma. Nannie Doss was born on November 4, 1905, as Nancy Hazel to mother Louisa and father James F. Hazel in Blue Mountain, Alabama. Nancy/Nannie had three sisters and one brother. She did not like her father because he was controlling and violent towards her children and wife which resulted in Nancy/Nannie having an unhappy childhood. Her family was poor, and she did not gain much of an education because her father forces her and her siblings to work on their family farm instead of attending school resulting in Nancy not being able to read well. Nancy suffered severe headaches, depression, and blackouts for several years after hitting her head at the age of seven on a metal bar in front of her seat in a train while going to visit family. Nancy loved to read her mother"s romance magazines and then fantasize about her romantic future. Her father forbade her and her sisters to wear makeup, revealing/attractive cloth and to go to dances and social events during their teenage years. He forbade all of those things because he was trying to protect them from men doing wrong to them but the girls were still molested by men on several occasions. Nancy/Nannie and Charley Braggs both worked at a Linen Thread factory, dated for four months and got married when Nancy was 16-years-old with her father"s approval. Charley"s mother was never married and insisted on living with them after their marriage, and she tried to control everything. Charley"s mom did not let Nancy do the activities she wanted to and limit Nancy to what she wants to do. Nancy gave birth to four girls from 1923 to 1927, but the stress of living with her mother-in-law was getting to her. She soon began drinking and became addicted to smoking. Charley started to leave home for several days as he and Nancy began suspecting each other of infidelity. The couple"s two middle daughters died in 1927 from what is alleged to be food poisoning, and Charley thinks that Nancy killed their girls and fled with their firstborn daughter Melvina. He left their newborn daughter Florine behind resulting in Nancy taking a job at the cotton mill to support her daughter Florine after Charley"s mother died. Charley returned with Melvina in 1928 during the summer and brought along a divorced mother with her own child. Charley claims that he left with Melvina because he was scared of Nancy, so Nancy took her two daughters to her mother"s house. Nancy began reading romance material again while living and working in Anniston as a way to comfort herself from loneliness. She responded to 23-year-old factory worker Robert Franklin "Frank" Harrelson from Jacksonville who posted an ad in the lonely hearts column. 24-year-old Nancy married Frank in 1929, two years after divorcing Charley. Nancy lived with her daughters and Frank in Jacksonville but a few months later discovered that Frank was an alcoholic who has a criminal record for assault. She did not mind his history and stayed married to him for about 16 years. Melvina became a mother in 1943 when she gave birth to her son Robert Lee Haynes. She gave birth to another baby two years later, but that baby died shortly after birth. Melvina was unsure if she saw her mother sticking the newborn baby in the head with a hatpin but her husband and sister told her that Nancy told them the baby was dead and they saw her holding the pin. The doctors could not confirm why the baby died which lead Melvina and her spouse to drift apart. Melvina had a terrible fight with her mother and left her son in the care of his grandmother Nancy while she went to see her father. Melvina"s son Robert had a mysterious death on July 7, 1945, which was diagnosed as asphyxia from unknown causes. Nancy collected $500 two months later from the life insurance policy she had taken out on Robert. Frank drank heavily one night in 1945 and raped Nancy/Nannie. Nannie saw Frank"s corn whiskey jar on the ground the next day while tending to her rose garden and put rat poison in the jar so that her husband Frank could have a painful death which he did that evening. Nancy/Nannie found her third husband, Arlie Lanning, in the lonely-hearts column in Lexington, North Carolina, and they got married three days later. Arlie was no different from Frank as he was also an alcoholic who loves women, but Nancy did not mind as she was the one who disappeared months from home often. She was the perfect wife when she was home and received support from the town when Arlie died from heart failure. Nancy and Arlie"s house was left to Arlie"s sister, but soon after the house was burned down and the insurance money went to Widow Nannie Lanning. She took no time to bank it but shortly after, Arlie"s mother passed away in her sleep, and Nannie/Nancy headed to North Carolina. She went to her bedridden sister Dovie"s home who died soon after Nannie arrived. Nannie met Richard L. Morton after joining the Diamond Circle Club in Emporia, Kansas. Richard was a womanizer and not an alcoholic, but he was poisoned to death April 1953 which was only three months after Nannie"s mother, Lou started to live with them. Nancy/Nannie met Samuel Doss in Tulsa, Oklahoma in June 1953 and married him. Samuel was a churchgoer, clean-cut and did not like the romance novels that Nancy/Nannie was reading. Samuel was diagnosed with a severe digestive tract infection at the hospital after having flu-like symptoms in September 1953. He was discharged from the hospital on October 5, but he did not live to see the next day because Nancy murdered him. She wanted to collect the two life insurance policy she took out on him, but his doctors became suspicious of his unexpected death and performed an autopsy which reveals a significant amount of arsenic in his system. Nancy/Nannie Doss was arrested. Nannie/Nancy Doss confessed to killing her sister Dovie, four of her husbands, her mother, her grandson Robert, and her mother-in-law Lanning. Oklahoma state only tried Nannie/Nancy (who was found to be mentally fit for the trial) for Samuel Doss case because he was a Nazarene minister that met Nannie through the lonely hearts club advertisement. Samuel was grieving the loss of his wife and nine children who died during a tornado in Madison County Arkansas. Samuel Doss"s brother, Ramon Theodore Doss insisted for an autopsy to be performed on his brother and the results state that the arsenic in his body was enough to kill about forty horses. Samuel Doss loved Nannie Doss" sweet potato pie so she laced the sweet potato pie with arsenic on three different occasions before his death. Nannie was not given the death penalty because of her gender and was sentenced to life in prison after pleading guilty on May 17, 1955. Nannie Doss admitted to killing several people, but she was not convicted of any other killing then Samuel Doss. She died at the age of 59 on June 2, 1965, from leukemia in the Oklahoma State Penitentiary hospital ward. Nannie Doss serial killer is a female serial killer. The Giggling Nanny, The Giggling Granny, The Jolly Black Widow, The Lonely Hearts Killer is a female serial killer.